Wight Heat processes clean waste wood, mostly shavings, sawdust and offcuts from Period and Modern Joinery, timber merchants, G E Bucketts, the Isle of Wight College, other carpenters and boat builders. The waste is tipped into the briquette machine’s hopper, then drawn down into the hydraulic press, and emerges as a formed briquette into the bags on the bagging carousel ready for sealing. The natural lignin in the wood binds the material. Customers can collect from the farm or arrange a delivery. Wherever possible, deliveries are combined with other outward goods to save carbon emissions and fuel. Wight Heat is a social enterprise supporting youth work in the South Wight (SWAY) and providing young people with work experience. Find out more. Wight Heat is open Monday to Friday 9am to 5pm, Saturday we are usually here but its best to check first. perfect for sitting out on summer evenings. or cedar and winter spice for warm winter evenings. 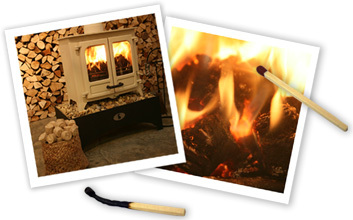 Visit Charnwood for more information about multi-fuel and woodburning stoves.